When it comes to finding an SUV that is just as adept at commuting as it is at adventuring, there’s really only one vehicle that can do the job. The Jeep Compass is everything drivers in the area of Plantation need in terms of performance, off-road readiness, and technology. In this review, we at Massey Yardley CDJRF will introduce you to the many incredible features that make the Compass stand out against its competitors. Let’s get started by taking a peek under the front hood to see what makes this model move! Leading the way in the Jeep Compass is a 2.4L I4 MultiAirÒ engine that offers the perfect balance of power and efficiency. This engine, which can be paired with an available 9-speed automatic transmission, achieves an impressive EPA-estimated 23 city / 32 highway MPG1. On top of all the miles per gallon you get with this efficient system, you’ll also have 180 horsepower and 175 lb-ft of torque to work with. This kind of power allows you to tow up to 2,000 pounds of trailer weight. As a Jeep, the Compass is ready for any type of adventure with its lineup of available JeepÒ 4×4 systems. These 4×4 systems smartly monitor the path beneath you, be it dirt or concrete, and will automatically adjust the power distribution between the four wheels to maximize your traction. For even more control and confidence, the Jeep Compass can also be fitted out with an available Selec-TerrainÒ Traction Management System. With this system, you can customize your own traction by switching among five unique driving modes. Switch among Auto mode, Snow mode, Sand mode, Mud mode, or Rock mode. To top off your capability in the Jeep Compass, you’ll have your choice or nine different types of wheels. Depending on your driving and adventuring habits, you can choose highway-ready 16-inch aluminum wheels, or beefy, confident 19-inch polished aluminum wheels with gloss black painted pockets. Inside the Jeep Compass, you’ll find a healthy menu of advanced technology features that will enhance your driving experience even more. For starters, this model offers an available UconnectÒ 4C NAV infotainment system. With this intuitive system, you’ll get a large 8.4-inch touchscreen, a SiriusXMÒ All Access Package, and an array of connectability features. Stream your favorite music or make hands-free phone calls using BluetoothÒ connectivity. Access your favorite smartphone apps via Apple CarPlay® or Android AutoÔ. You can even control these features with voice commands. While you’re enjoying all these features, you’ll be able to follow easy turn-by-turn directions to all your destinations with the included navigation system. 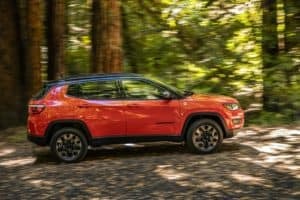 Test Drive the 2019 Jeep Compass! As you can see, there’s a lot to love about the Jeep Compass. Now that you have a better idea of what this vehicle can do for you, it’s time to get behind the wheel and experience it for yourself. Shoppers in the Plantation area should give us a call at Massey Yardley CDJRF today to schedule a test drive in the Compass! 1 EPA estimated mpg with 2.4L engine and six-speed manual transmission, 4×2. Actual mileage may vary.